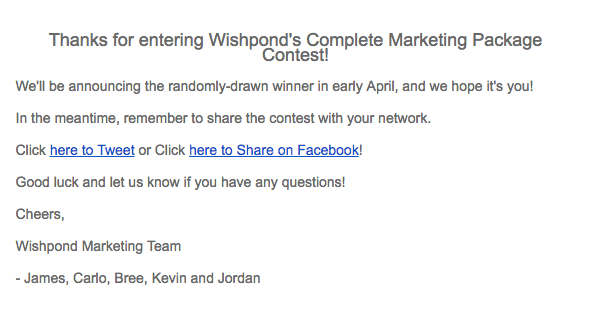 To say that we specialize in online giveaways here at Wishpond would be an understatement. We live, eat, and breath online giveaways. It's our bread and butter. Online giveaways are incredibly effective at growing brands quickly, gaining followers, and collecting new leads. There really are no downsides to running one for your business. Now, as a company consumed by online giveaways you'd think we have some secrets when we run them for ourselves. Nope. We run the exact same type of giveaways we recommend to our self-serve users and our fully-managed clients. That's because the strategy works. In the past year we've run 6 iterations of the same structured giveaway and generated more than 3,000 new leads. This article will give you a step-by-step guide to exactly how we run online giveaways and consistently receive upwards of 500 valuable new leads each time we do. This page was made using Wishpond's giveaway template and my own (mediocre) design ability. 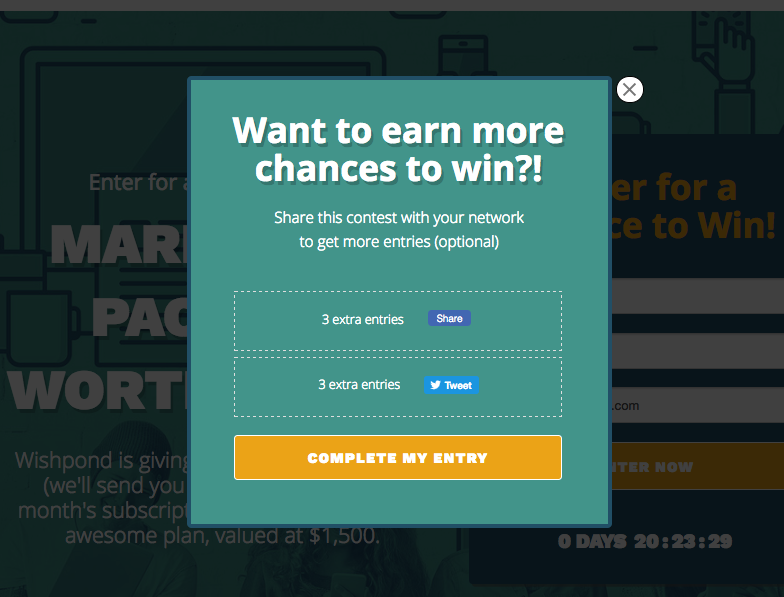 The share incentive or "bonus entry" popup is a crucial part of promoting our campaign. Because we (as many business do) use our newsletter to drive the majority of traffic to our campaign, we want to maximize the chance that those people share the campaign with their friends and colleagues. After all, we already have the contact information of our own subscriber list. The goal of this online giveaway is to generate new prospective customers. 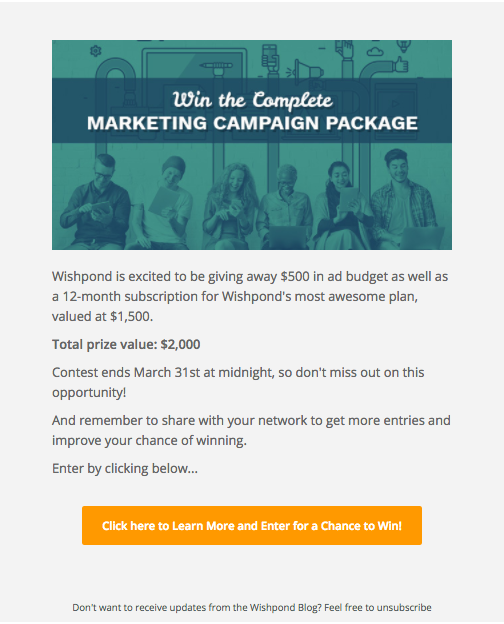 So we use Wishpond to create a share incentive popup which appears when someone clicks "Enter Now." It's an optional thing, but gives entrants an extra entry (increasing their chance of winning) if they share the giveaway with a Friend on Twitter or Facebook. They're never more motivated to do this than right at the point of entry. They're sold on the value of the prize and are determined to win. Give them an increased chance of doing that and suddenly you expose your giveaway to a whole group of people you never otherwise could have. This is an essential part, simply to confirm with people that they have been entered to win. Beyond that, you should also be sure to include a "in the meantime, remember to share the giveaway with our network!" and provide easy "click to tweet" and "click to share on Facebook" links. These are super easy to create by using clicktotweet.com and ShareLinkGenerator.com. This is a super simple email, but it does go a long way to personalize interaction and get prospective customers used to receiving valuable emails from real people. Also, even though not every recipient is going to share the giveaway, everything helps when it comes to spreading the word. 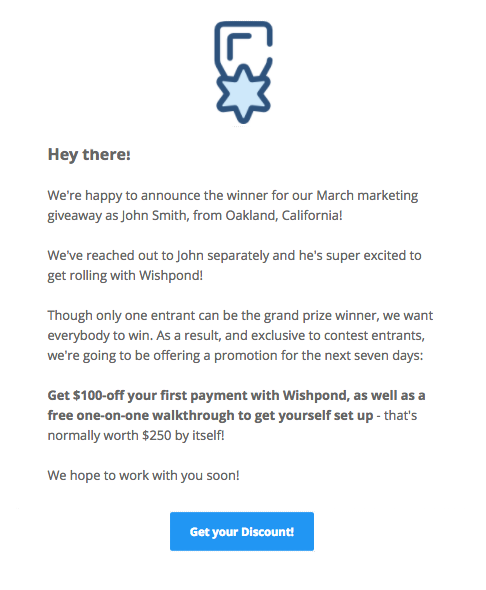 So this is the primary way that software companies, with low lead conversion rates, can promote their online giveaway. If you're an ecommerce company or retailer, you can more easily find a positive ROI using Facebook Ads. 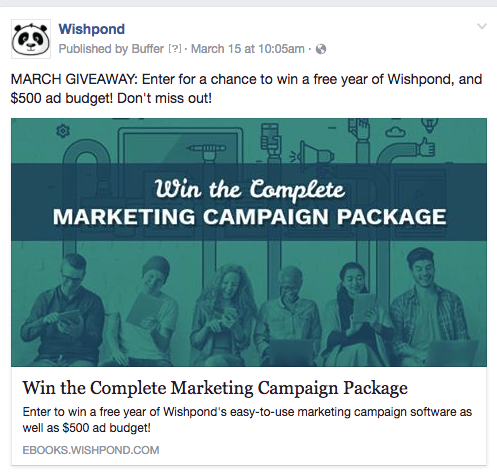 For a guide on how to do that, check out "How to Ensure a Successful Online Contest with Facebook Ads." Long story short, retailers and ecommerce companies will be able to convert a significant number of your giveaway leads to become customers - say, conservatively, 10%. If the lifetime customer value is $30, then generating 1000 leads with an ad spend of $1000 and converting 100 of them means you get an ROI of 200%. Software and B2B are a bit different, though I'd recommend you test it for yourself. Just make sure that you're able to convert enough giveaway entrants into customers for your ad budget and the rest of the work is worth it. 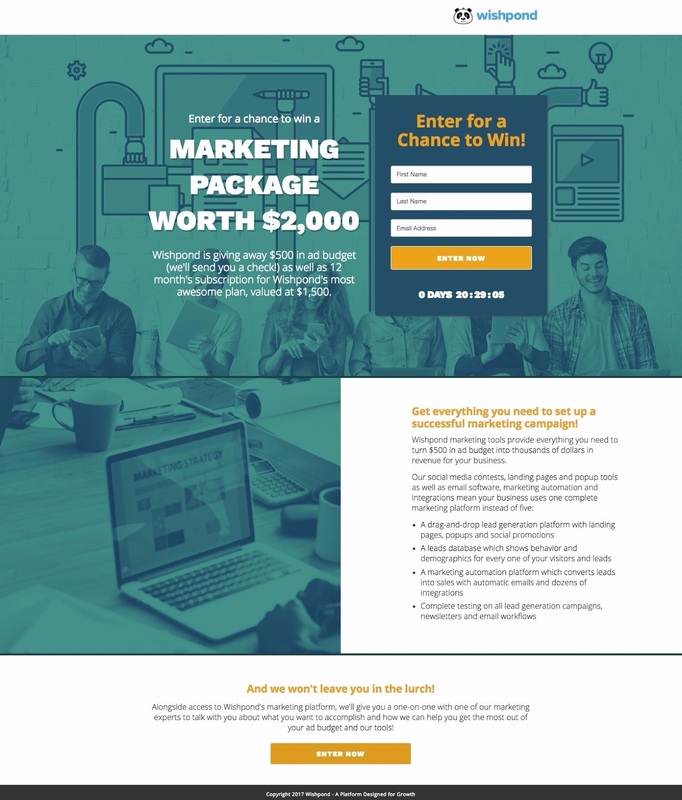 Subject: Enter to Win a Marketing Package Valued at $2,000! Top Tip: We also add a P.S. to all the newsletters we send while the giveaway is running which reminds subscribers they can still enter and provides a link. This is a great strategy no matter what industry you're in. Notify your Facebook and social media Fans about your giveaway. If they're already customers, a best practice is to also prompt them to share with their friends and recommend they try to enter to win a product they love. Best practice here is to, as much as possible, take the design and copy from your giveaway page and use it within the post. You want to create cohesion between any promotional platform and the giveaway page itself, so people feel like they know what's going on. Any substantial design difference or copy changes will throw off the people who click your social posts and cause them to bounce/not convert at a greater rate than otherwise. After all, no matter what business you're in, there's little point in generating a single giveaway lead if you can't turn them into a customer. The best way to do this is to send an email after the giveaway is over with a discount code for a product related to prize they wanted to win. Don't send it during the promotion because your entrants think, on some level, that they're going to win. They're not going to forfeit the chance that they could win something completely for free in response to 10% off. There you have it - our in-house strategy to run online giveaways. Hopefully seeing a walkthrough of how we do it will inspire you to find the same success we do on a consistent basis. If you have any questions about online giveaways or how to set up a marketing campaign, don't hesitate to reach out in the comment section below!